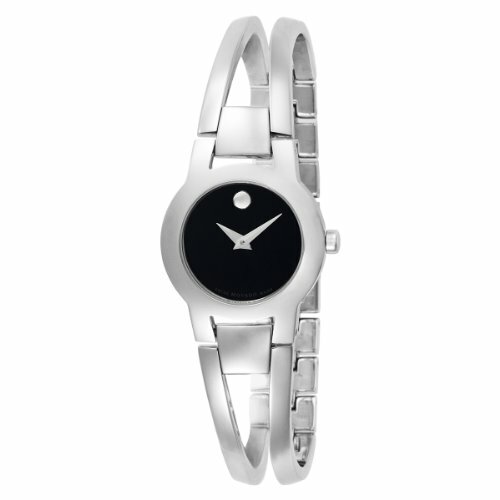 The clean face and superior Swiss design of the Amorosa Women's Watch by Movado makes it a striking formal accessory. Constructed with a stainless steel case, the sleek timepiece includes a fixed stainless steel bezel and a stainless steel link bracelet with a secure jewelry clasp. A durable sapphire window shields the dramatic black dial face, which features a silver-tone hour index at 12 o'clock and matching silver-tone watch hands. This beautiful Swiss-quartz-powered timepiece is water resistant to 99 feet.